So I have to admit something right off the bat. Until very recently, the past couple of months actually, I thought that poppy seed were little black seeds only – like the kind you find in poppy seed muffins or bagels. And I was always a bit confused because whenever I ate Aloo Posto, loosely translated as potatoes with poppy seeds, I could never see the poppy seeds. It just looked like potatoes with some sort of lightly colored paste over everything that was a bit yellow from turmeric. Confusing appearance aside, the taste of this dish never confounded me – I have adored it from the get-go. Soft potatoes are smothered in a lightly nutty paste and finished with a pungent hit of mustard oil, this dish manages to taste sharp and gentle all at the same time. It was only recently that I figured out this culinary riddle when I was browsing through my local Indian market and stumbled across a bag of poppy seeds….that were a light beige in color. And after doing some very light internet research (yep, wikipedia) I learned that these little seeds range in color from black to even slate blue from Holland to the light beige ones from India that I snagged at the store. I also learned that these seeds are used in cooking all over India from Karnataka in the South to Gujurat further North, mostly in desserts. Once I had the seeds in my possession I obviously had to make aloo posto. I consulted my small collection of Bengali cookbooks and only one had a recipe for this popular dish which was somewhat surprising. The majority of Bengali meals I have had at people’s home have included aloo posto in the spread. 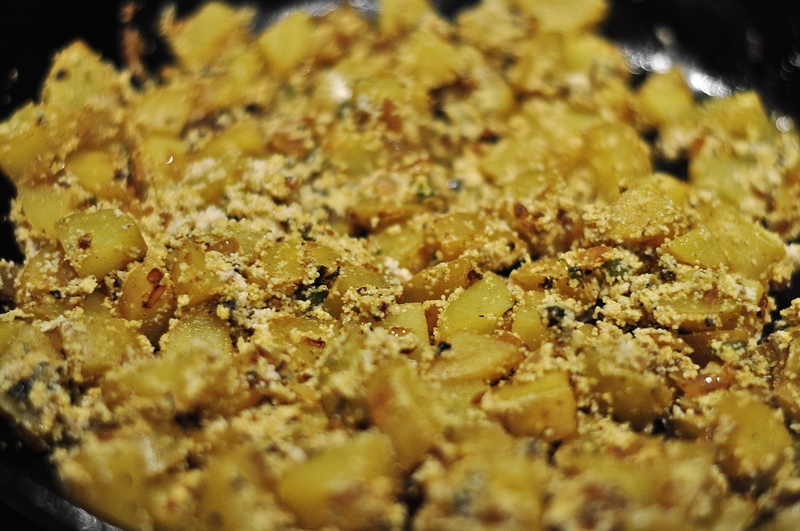 And generally when you mention to a Bengali person that you have never had the pleasure of tasting his or her cuisine, one of the first dishes mentioned will be these potatoes with poppy seeds. But I think it might be so ubiquitous (like peanut butter and jelly here) that Bengali cookbook authors don’t think to include it in their collections. No matter, I had one great recipe to follow from Sandeepa Mukherjee Datta’s wonderful book, Bong Mom’s Cookbook. I love the book and have sang its praises before. 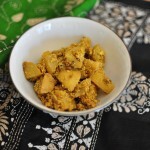 In the preface to the recipe, Datta mentions that you can prepare any vegetable with this poppy seed paste and she often uses it on things like broccoli and beets which I find intriguing. I was going to experiment, but my husband, Arjun, begged me to please keep it to just traditional potatoes for my first go. The resulting dish came together pretty easily and tasted absolutely spot on. I served it with the shrimp coconut curry I wrote about last week but it would be at home in any Indian spread. I also think it would be a surprising but welcome addition along side a nice roast chicken. This recipe does call for a few speciality ingredients like mustard oil, beige poppy seeds, fenugreek and nigella seeds but don’t let that scare you off. The last two spices I listed are optional. All the items can be purchased at an Indian market of course but also online. I’ve included links below in the recipe notes and also put the items on the shop my favorites page. My major cooking spree with my mother got delayed a few days as my children both got sick (this seems to happen at terribly inconvenient times and I’m trying not to take it personally) and so far we have just gotten to tamarind chutney which is awesome. Tackling a few things today and tomorrow (barring any other health crises) and my tummy is rumbling just thinking about the goodies to come! There is so much good stuff to share in the coming weeks, so go ahead and subscribe to samosa junkie at the top right if you haven’t already. It’s like getting a tasty hit of exotic Indian awesomeness in your inbox once a week and who doesn’t need that! 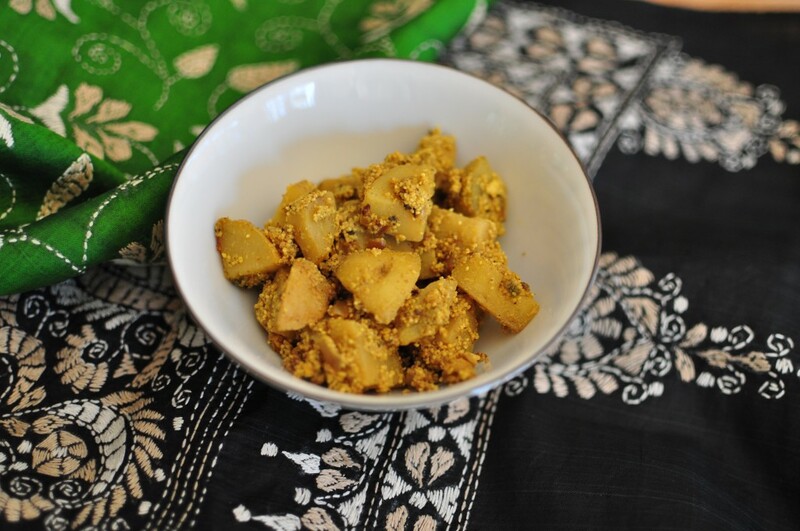 A classic Bengali dish that combines comforting potatoes covered in nutty poppy seed paste and finished with the sharp taste of mustard oil. 1. Combine all the whole spices together in a small bowl. The nigella seeds and fenugreek ore very traditional but optional in this recipe. This spice mix will still have plenty of delicious flavor without them. Grind the poppy seeds to a fine powder in your spice grinder. Mix with three tablespoons of water to make a thick paste. Heat 1 tbl of grapeseed oil over medium heat until it shimmers. 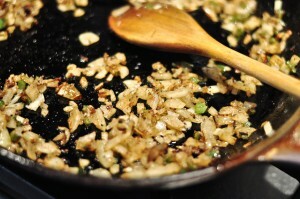 Add the paanch phoron and red chili and let them sizzle for about 30 seconds. Add the chopped onion and green chili if you are using it and fry the onion until it softens and starts to brown - about 3-4 minutes. 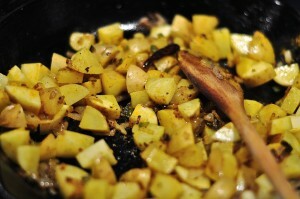 Add the potato cubes and sprinkle with turmeric. Stir well and sauté the potatoes until they start to turn golden. Add the poppy seed paste plus 1 tbsp of water to the dish. Stir until the paste has uniformly coated the potatoes. Add 3/4 cup of water, salt and sugar to the pan and cover. Cook until the potatoes are tender and the water has mostly dried up - 7-8 minutes. Drizzle the mustard oil over the dish and stir well. 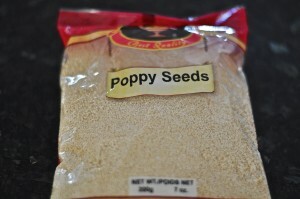 ** Beige poppy seeds are available at Indian markets or online. Mustard oil is a deeply golden color and has a sharp, mustard flavor. You can purchase it at Indian markets or online. Nigella seeds are teardrop shaped black seeds with an mild onion flavor. You can purchase them at Indian markets or online. Fenugreek seeds are boxy brown seeds that have a pleasing bitter taste. You can purchase them at Indian markets or online. I love aloo posto and it’s been too long since I’ve eaten it. I’m definitely making the trek to the closest Indian store for the beige poppy seeds. Thanks for the recipe! Tanya, you will have to let me know how it turned out and if it lives up to what you ate growing up!